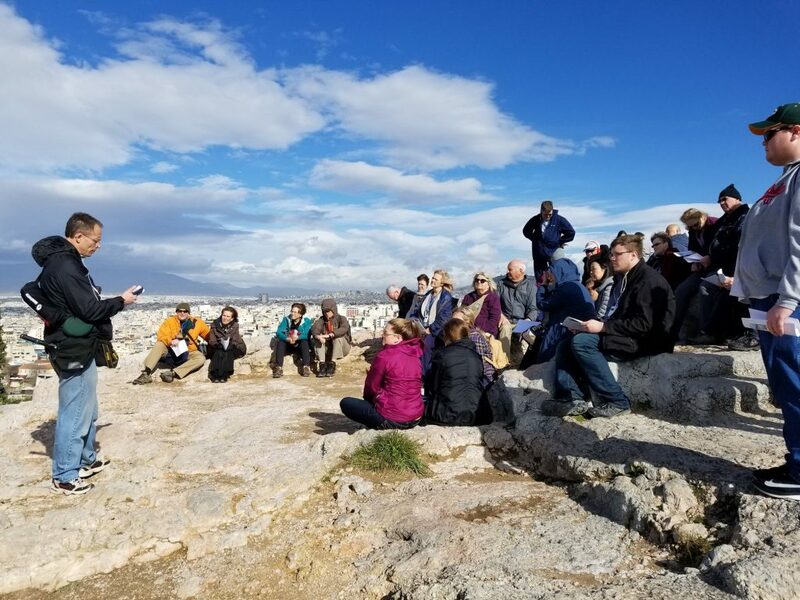 This Winterim Professor Geiger, Caleb Rothfuss, myself, students from Wisconsin Lutheran College, Asia Lutheran Seminary, and several others had the opportunity to travel to Greece and Italy and walk in the footsteps of the apostle Paul. We left behind the cold weather of Wisconsin and arrived to more cold and snowy weather (something pretty rare for that part of the world). I must say, however, that this snow provided us with a unique opportunity that not many get to experience when traveling to Greece. Snow aside, it was a pretty amazing trip. A few of the highlights from this tour would be stops at the Colosseum in Rome and the Parthenon in Athens. But this trip included so much more. We had the privilege of visiting several ancient cities where the apostle Paul spent time preaching the gospel message of Jesus. Places we can read about in the Bible — cities like Corinth, Thessalonica, Nicopolis, Philippi and others. We had the opportunity to see the ancient ruins of these cities, to see the places where Paul preached and to walk on the roads that Paul used as he went on his journeys. In addition, while in Rome our tour group was able to see several significant sites for the history of the Lutheran church, and the Christian church in general. Churches like St. Peter’s Basilica, which was built with money from the sale of indulgences and St. John Lateran which is the home church for the Pope. And no trip to Rome would be complete without a visit to the Sistine Chapel, another place we got to check out. This trip provided out tour group with many experiences and lessons that will stick with us forever. I think all of us returned home with a greater appreciation for the mission work of the apostle Paul. Much of Greece and Italy is mountainous, and those cities aren’t exactly close to each other. I think I can speak on behalf of our group and say that we all left with a better understanding of the geography and culture of the places where the gospel was first preached. Our time in Greece and Italy was a tremendous blessing and the memories and lessons we gained will not be soon forgotten.